The shoreline of Lake Tahoe stretches for over 70 miles / 113 km and so if you are planning to travel around and properly explore the attractions on offer, you will need to plan you transport. Do be sure to consider the time of year that you are visiting, since winter snowfall can be heavy. 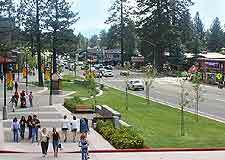 The Amtrak train station within nearby Truckee (north Lake Tahoe) serves as a major regional transport hub for bus travel. In the winter many ski resorts around Lake Tahoe also lay on their own shuttle transport, collecting passengers from as far afield as Reno, Sacramento, San Francisco and Truckee, amongst other popular locations, and also traveling between leading hotel resorts. 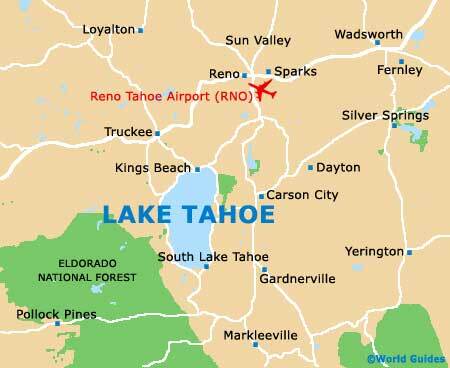 A number of prominent commercial airlines fly to and from the Reno-Tahoe International Airport, which lies on the northeasterly outskirts of Lake Tahoe and just 4 miles / 6.5 km to the southeast of Reno. Airlines operating here include Alaska, American, Continental, Delta, ExpressJet, United and US Airways, all of which link destinations such far and wide, with travel to the main cities including Atlanta, Boise, Chicago, Dallas, Denver, Houston, Las Vegas, Los Angeles, Oakland, Phoenix, Portland, Salt Lake City, San Diego, San Francisco, San Jose, Seattle and also Tucson. Both Truckee and South Lake Tahoe also feature their very own airports, although these are small and mainly used by private planes. Other important airports slightly further away include both Sacramento International Airport (SMF) and also San Francisco International Airport (SFO). 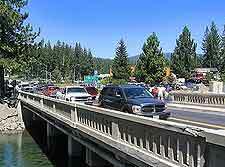 One of the most popular ways to travel around Lake Tahoe and around its endless shoreline attractions is by car. However, whilst the freedom offered with this mode of transport is quite unbeatable, and rental prices are very reasonable, it is worth noting that this is a mountainous region and during the cold winter months, heavy snowfall can be a problem on some roads, particularly between December and March, when carrying snow chains is advisable. 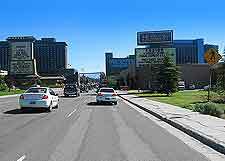 A number of busy highways and interstates surround Lake Tahoe, with the Interstate I-80 making it easy to drive in a southwesterly direction to Sacramento, San Francisco and even the Napa Valley, and also northwards, to both Reno and Sparks. Book your Reno Car Rental here. Those wishing to travel to Lake Tahoe by rail will find that the best option is to arrive at the neighboring Amtrak train station within Truckee, on the northwestern outskirts of the lake's shore. The line transports passengers from San Francisco / Emeryville and heads in a northeasterly direction, passing Richmond, San Pablo, Vallejo, Fairfield, Vacaville, Sacramento, Roseville, Auburn, Applegate, Emigrant Gap and Soda Springs, along the way. 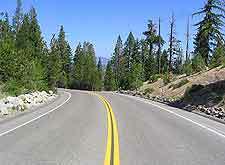 This route continues to the northeast, linking Lake Tahoe with Reno and Sparks. Regular buses link the main places of interest around the shoreline, traveling to South Lake Tahoe, Meeks Bay and Tahoe Vista, and in the winter months, to many of the surrounding ski resorts. These buses are operated by the Tahoe Area Rapid Transit organization, being often referred to as TART buses. During the winter months, a number of the largest ski resorts provide their very own free shuttle transport, along with a number of Nevada casinos. Greyhound buses travel on a daily basis between Truckee, Sacramento and San Francisco, although no longer stop at Stateline.